Announcing the upload of our newest PDF catalogue: Find Another! A Short Summer Miscellany. Here at Tavistock Books we prefer, when able, to pursue the 3rd option as our primary business paradigm, for, by definition, the 3rd tenet encompasses the first two. Here then is our Summer list, which is comprised of 30 items, each of which is the only copy currently offered on the market. * Or, borrowing Peter Howard’s slightly more emphatic expression, “Find Another!”. We time the issuance of this list to coincide with the convening of this year’s RBMS Conference, whose attendees we welcome to Oakland, home of the World Champion Golden State Warriors, and a scant 2 mile 51A bus ride from Alameda, where one will find Tavistock Books, soon to celebrate our 18th anniversary on Webster Street. 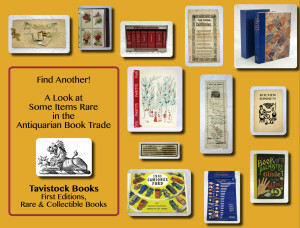 We also welcome your visit to the shop, should you care to come browse 15,000 other books, et al, in addition to the 30 items found in this catalogue. Enjoy – both the list, as well as your stay in Oakland, should you be one of the many visiting our lovely San Francisco Easy Bay. *a recent point-in-time determination made by searching viaLibri.net, with the full realization that the market is dynamic, and other copies may come and go over a given period of time. This entry was posted in Uncategorized on June 23, 2015 by tavistock_books.